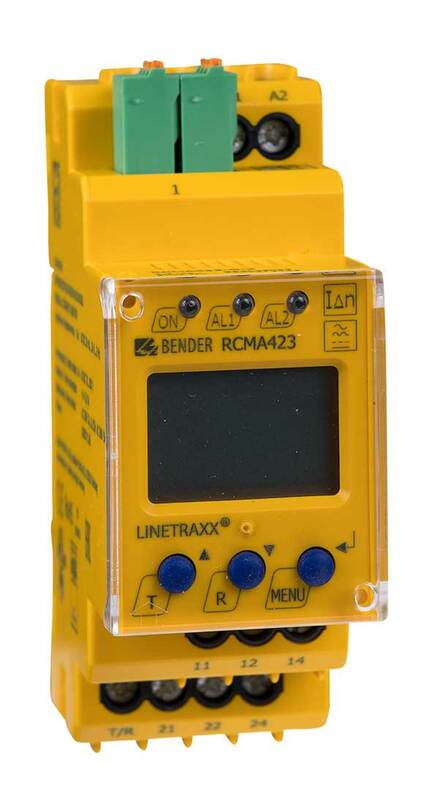 The AC/DC sensitive residual current monitor RCMA423 is designed for monitoring earthed power supply systems (TN and TT systems) where smooth DC fault currents or residual currents continuously greater than zero may occur. These are in particular loads containing six-pulse rectifiers or one way rectifiers with smoothing, such as converters, battery chargers, cons­truction site equipment with frequency-controlled drives. Currents in single conductors can also be monitored by RCMA423. Monitoring of variable-speed drives, UPS systems, construction site equipment, printing machines, battery systems, laboratory equipment, wood working machines, MF welding systems, furniture industry, medical electrical equipment, etc.